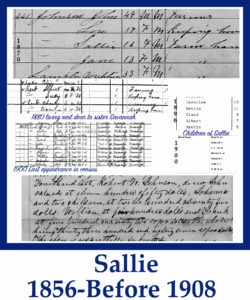 Sallie was born in 1856 during a time her family was in peril of being separated. The Johnson's slaveowner John Caldwell Johnson was deceased in January 1856. During 1856 probate records her mother Joanna went from one child (Savannah) to having two children by December 1856. Sallie appeared in the 1900 census with her husband Alfred. In the 1910 census he has been married to Lucinda for two years. She is presumed dead between 1900-1908.